Transparency Market Research has published a new report titled “Vinyl Acetate Monomer (VAM) Market - Global Industry Analysis, Size, Share, Growth, Trends and Forecast, 2014 - 2020” According to the report, global vinyl acetate monomer market was valued at USD 6.82 billion in 2013 and is anticipated to reach USD 9.26 billion in 2020, expanding at a CAGR of 4.5% between 2014 and 2020. The market for vinyl acetate monomer (VAM) is driven by high demand for adhesives from end-user industries such as construction, automotives and furniture. Moreover, the global vinyl acetate monomer market is driven by increasing demand for VAM copolymers from paints and coatings industry. Vinyl acetate monomer (VAM) is one of the key polymers used in manufacture of adhesives and emulsions. Increasing demand for ethylene-vinyl acetate and ethylene-vinyl alcohol from solar PV cells and the food packaging industry respectively are likely to provide better opportunities for the vinyl acetate monomer (VAM) market over the forecast period. However, highly volatility of raw material prices, limited technology and over production in the market is anticipated to hinder the growth of the market in near future. Application segments such as polyvinyl acetate (PVA/PVAc) and polyvinyl alcohol (PVOH) exhibited the highest demand for vinyl acetate monomer (VAM) in 2013. Both polyvinyl acetate and polyvinyl alcohol are commonly used in the production of adhesives, paints and coatings and also in the paper industry. 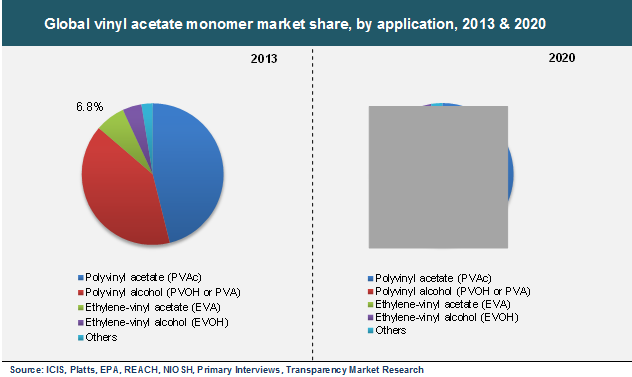 Ethylene-vinyl acetate demand accounted for around 7% in the vinyl acetate monomer market in 2013. The demand for ethylene-vinyl acetate is likely to grow in the near future owing to demand from the packaging and energy industry segments. Ethylene-vinyl acetate, which is required in manufacturing of food packaging films, is estimated to be the fastest growing application in the vinyl acetate monomer market in the next few years. With over 40% share in total demand, Asia Pacific dominated the demand for vinyl acetate monomer in 2013. The region is projected to demonstrate latent growth for the vinyl acetate monomer (VAM) market during the forecast period. In terms of market share, Asia Pacific was followed by Europe and North America, both of which are projected to exhibit relatively slower growth numbers for the vinyl acetate monomer market during the forecast period. The demand for vinyl acetate monomer is increasing slightly in North America region due to an increasing demand from the adhesives and packaging industries. Rest of the World is anticipated to witness stable demand for vinyl acetate monomer between 2014 and 2020.